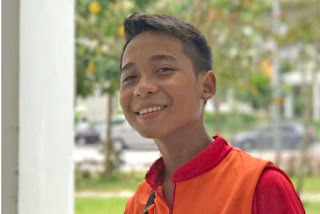 SINGAPORE - Muhammad Hambali Sumathi, 12, loved playing football. As a member of Geylang Methodist Secondary School's football club, Hambali was quite good at it, too. But on Monday (Apr 24) morning, on the very field he spent many happy hours playing, the bubbly Secondary 1 student lost his life in a freak accident. Hambali had reached for the crossbar of the goalpost yesterday to do a pull-up when he fell backwards. The structure tipped over and struck his head. He was conveyed unconscious with head injuries to KK Women's and Children's Hospital, where he later died. The incident happened close to 9.15am during a physical education class. The students had been playing five-on-five football, with groups occupying half of the school field. One student, Amos Leong, 12, said: "(Hambali) felt frustrated when his team mate did not score a goal." This was when the boy, whom The Straits Times understands was around 1.68m, reached for the crossbar. A classmate, who declined to be named, said: "I think his hand slipped, he fell, and then the goal post hit his head. When it fell on him, his leg got stuck in the net. "I was right beside him." This was when he, together with three others, rushed forward to lift the heavy goal post off their friend. Amos said he went to the school's general office to call for help. The Singapore Civil Defence Force said it received a call for assistance at about 9.35am and dispatched an ambulance to the school's Geylang East campus. Speaking to ST at the family's home in Aljunied Crescent, Hambali's father said he received a call from the school's principal around 9.50am, telling him of the incident. Tears welled up in his eyes as 54-year-old Sumathi Abdul Hamid recounted how he immediately took leave from his houskeeping job at a hospital to be with his son. "The doctors tried to save him... for more than an hour. But they couldn't," he said, choking up. "They told me, 'I'm very sorry.' "
Hambali's mother, Madam Rajimah Jaafar, was inconsolable. The 49-year-old housewife, who declined comment, fainted twice yesterday, said a family friend who wanted to be known only as Madam Norayati. A Manchester United fan, Hambali, the fifth of seven siblings, was a playful and clever boy, said his brother. "I often saw him playing basketball and football downstairs, but his school results had been good," said Mr Mohammad Rizwan Abdullah, 19, who is serving his national service. "I can't believe he is gone." Mrs Jenny Poh, 41, whose daughter is Hambali's classmate, said she was sad to hear of the boy's death. "He was close to my children, as they always cycled together in the neighbourhood," said the mother of four, adding that he would come by her house about three to four times a week. In response to media queries, Geylang Methodist Secondary School's principal, Mr Wee Tat Chuen, confirmed that a student was involved in an accident on the school field yesterday morning during a physical education class. "(He) was an active and friendly boy who loved soccer. We are deeply saddened by this tragedy," said Mr Wee. "The school is in touch with the student's family, and is also providing the necessary support to students and staff affected." The school field has been closed to facilitate police investigations, which are ongoing, he said.